Home > Sports > Off the peak! The USO track, called “downdraft,” begins at 4,241 feet (at the top of the K-1 Gondola) and is 2.75 kilometers long. About 250 athletes will embark on the downhill course as part of the Fox US Open of Mountain Biking at Killington Resort Aug. 1-5, 2018. Some racers are expected to hit speeds of 40 miles per hour. Harper hiked the steep course with Killington’s trail building professionals and said, “It’s built for fun, but it will also be quite challenging.” Adding, “We’re not looking to create the most difficult race track in the world, that’s not sustainable. This new course will test racers’ skill and fitness. It’s a relatively long course, comparable to some classic European tracks,” he said, estimating that it’d probably take the top racers about 4 minutes to get to the bottom. Some parts of the new downhill course will be open to the public after the event, but other parts are exclusive to the USO, Harper explained. As always, the USO of MTB has attracted an international field of athletes to the event this year. Past winners of the downhill race include Sam Hill, Steve Smith, Tracey Mosely, Bryn Atkinson, Miranda Miller, Aaron Gwin, Jill Kintner and Neko Mulally, who won the 2017 US Open downhill. The open Pro/Am style format of the USO of MTB offers the most challenging and competitive racing in the nation, but also allows anyone to enter the Open Class and compete amongst the pros for the $40,000 cash purse. In addition to the downhill race, the 2018 Fox US Open will feature Enduro racing, a best whip competition, a youth downhill grom bomb downhill, an adaptive downhill, plus a Saturday night after-party with a free concert, food, drinks, vendors and more. This year will be the inaugural Enduro race for the USO of MTB. Enduro races are a mix of cross-country and downhill sections. 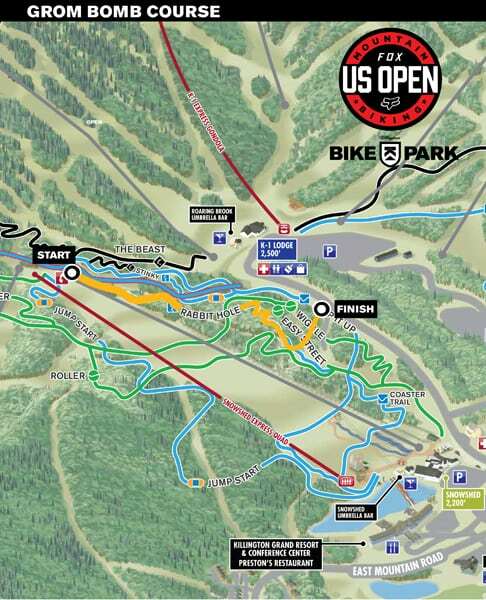 Killington’s course features five stages. Each downhill section is timed with “transfers” (uphill sections) where riders must ride or walk to the next stage (at ski resorts lifts are also used). The event takes about three hours. “Some say Enduro races are a truer test of riders’ skills, because racers need to climb as well as descend,” Harper explained. The USO best whip event will be held on Saturday evening immediately following the downhill finals. The best whip competition – always a crowd favorite – will feature big air on a new set of jumps near the K1 Umbrella Bar and will conclude with a free concert and after-party at K1. (To “whip” or “whip out” is when a rider turns the bike sideways in the air off a large jump.) To win, a rider must impress the panel of judges with amplitude, technique and crowd appeal. The kids’ open with “grom bomb” downhill gives younger riders a chance to shine within three age categories (7-9, 10-12, and 13-15.) This race is designed for kids that have real downhill skills, but aren’t ready for the big track. The adaptive downhill event will be put on in partnership with Vermont Adaptive. See related story on page ___. The Killington Bike Park is New England’s fastest growing downhill mountain bike park and features three high-speed lifts serving over 30 miles of trails, according to killington.com. In the summer of 2017, Killington Resort reached 23,000 mountain bike visitors, up from 2,000 in 2013, before its mountain bike expansions began. This year is the fifth and final year of Killington Resort’s five-year mountain bike buildout with Gravity Logic, a leader in bike park design. “The US Open of Mountain Biking is an amazing opportunity for Killington to show off the immense progress we’ve made expanding our mountain bike park over the past four seasons,” said Mike Solimano, president and general manager of Killington Resort. 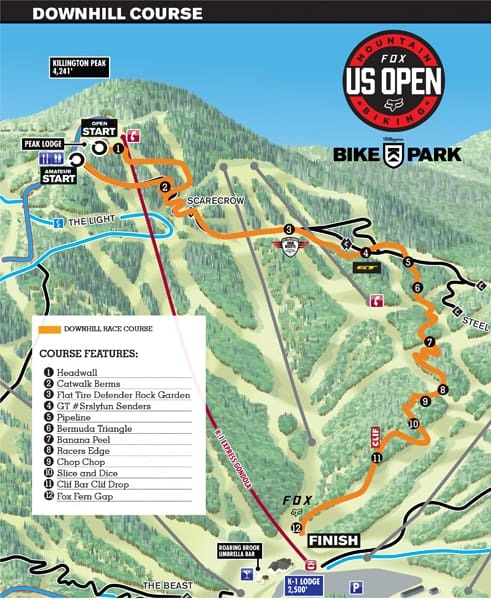 Historically, Killington Resort is known for developing and hosting large events and was chosen as the site for the 2018 event in part because of its new downhill track, onsite campground and extensive lodging options and restaurants, according to Fox Racing, the title sponsor for the US Open of Mountain Biking. But Harper still considers this a “building year,” as it’s only the second year since the event’s relaunch and the first year at a new venue. Given that, event organizers expect 3,000-5,000 visitors for the USO weekend at Killington. The event can accommodate 400-600 racers, but will have to be capped around that level as single timed-run racing only allows for so many to participate in a day. As for the growth of the USO of Mountain Biking, Harper hopes to grow the attendance of spectators and partnerships/sponsors, while continuing to attract top racers from around the world to compete. 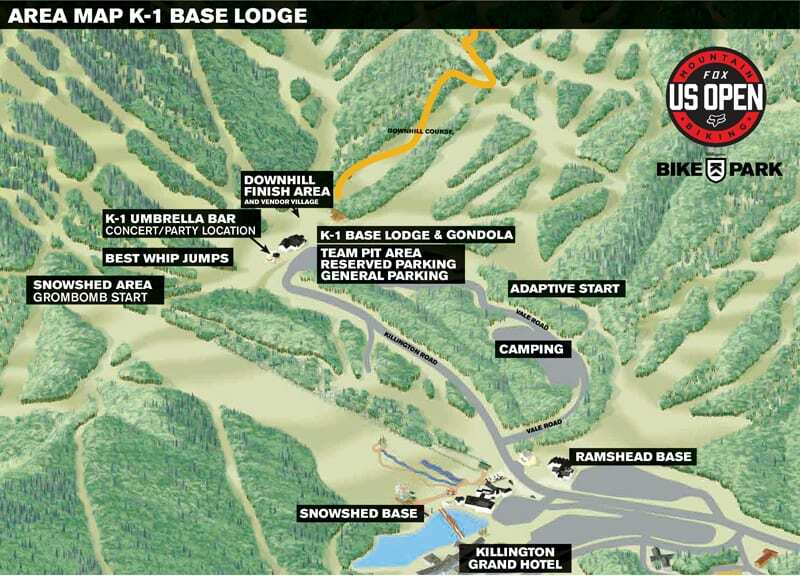 The Killington Bike Park will be open for riding to the general public during the USO weekend. For more information visit usopen.bike or follow the event on Instagram @usopenmtb or Facebook, facebook.com/ usopenofmountainbiking.